Interested in worshiping daily the newborn King this CHRISTmas season? How about through contemplating truths about Him in an eBook with daily advent readings? You can do just that with John Piper’s Good News of Great Joy: Daily Readings for Advent 2013. It’s not too late to begin an advent devotional! 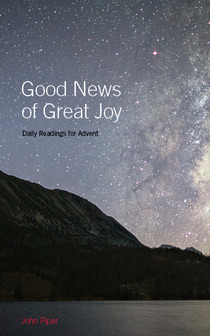 Good News of Great Joy: Daily Readings for Advent is designed especially for Advent 2013. With readings beginning Sunday, December 1, and going through Christmas Day, this book of Advent devotionals aims to put Jesus at the center of your holiday season. These short meditations are excerpted from the ministry of John Piper and correspond to the daily readings in Desiring God’s free devotional app, Solid Joys (available in iTunes and Google Play), as well as online. Would you like other John Piper books for FREE? Search “Piper” at our long-term eBooks page here at eChristianResources. There are currently 73 eBooks available with Piper as author or co-author!